The perfect summer staple in any women't closet. It is travel friendly and can be worn four different ways to effortlessly change up your look. One Size Fits All. 100% Cashmere. To wear different ways, just think '1/4 turn'. Start with the seam so it is the front. Then, do a 1/4 turn to wear asymmetrically. One more 1/4 turn and you can wear higher up in front (you can bring it up to your neck in front if you like) and it will be lower in the back. Great for over a dress! Lastly, you can thread it through to make a scarf. 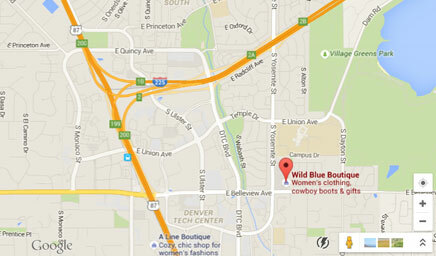 Located in the DTC (Denver Tech Center), in the Bonefish Grill shopping center.